Home » Category "Introduction To Spinning"
Blending may be defined as a condition in which every fibre characteristic is found in the same proportion as in the original blending within every unit cross section of the yarn .Fibre blending has been practiced since the beginning of the cotton textile industry due to the variation in the physical properties of cotton fibres like scrapple length, fineness, strength & cleanliness. To achieve uniform quality of product for a longer duration. To improve processing performance, increase yarn strength. To reduce & control cost of production. To facilitate the cotton for regaining its moisture content lost during baling. Metering determination & precise establishment of quantities of the individual components. Mixing that is bringing together of the metered quantities. Intermingling distributing the components evenly in the body of fibres. To achieve homogeneous blend the following techniques were adopted. The blending technique is still used successfully to permit the blending of cotton of contrasting fiber properties to produce a variety of end users. A doubling scutcher is requires, this has a conveyor lattice in feed on which from four to six laps could be laid. The lap sheets from these laps passed doubled through a beater position followed by pair of cages &lap winding device. Procedure very good transverse blends & also a good longitudinal blend. It is very easy process. Need for control of lap wt. Blending by doubling with laps at the card is sometimes used in high production cards. The procedure involves use of a double lap roll attachment whose feed rolls are positively driven by a link chain by the regular lap roll gear. Most intimate blend is obtained. This method is used to randomly mix two laps differing in color. It can’t be obtained from wide range. Controlled metered blending can’t be carried out. Only make a previously proceeded blend more intimate. With D/F blending the card slivers are doubled at the drawing process in a predetermined fashion. The percentage of the blending depends on the number of slivers processed. In processing of cotton this method is not used for blending purposes, but it is the most popular method for blending man-made fiber fiber with cotton. Suitable for blending two different cotton qualities. Provide best blend in the longitudinal direction. Working procedure is not complex. Stripiness may be produce in the finished product. Poor transverse blending in the product. Mixing is the first and important process in the spinning process. Mixing is a process by which different grade of same fiber are kept together. The length of the fibers should be equal otherwise various types of problem will create. Fibers having different length causes problem in drafting zone &also in simplex or ring frame. The second considerable factor for mixing is the micronaire value of fiber, the higher, the micronaire value, the fibers are regarded coarser. Color is also a very important factor in mixing. In case of cotton, it is measured by brightness of cotton and the presence of yellow color in cotton. The micronaire CV % of mixing bales should be 5%. The micronaire deviation of cotton fibers should be (+-0.1) or (+-0.05). Otherwise mixing quality cannot be classified as good quality. Length deviation should not exceed 10% deviation from mixing to mixing for the same lot. in mixing, two lot of adjacent color can be mixed, such as white and light spotted or light spotted and can be mixed. But white and spotted cannot be mixed. Every cross section of the lay down plant should be same. Which means average micronaire value should be controlled in every cross section. 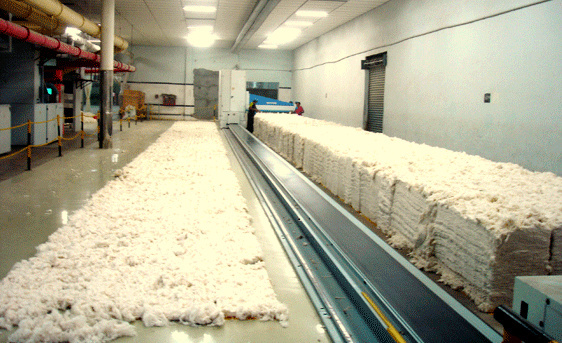 At first the cotton is made to go through dryers to reduce moisture content. Then cotton is made to go through cleaning equipment to remove foreign matters. 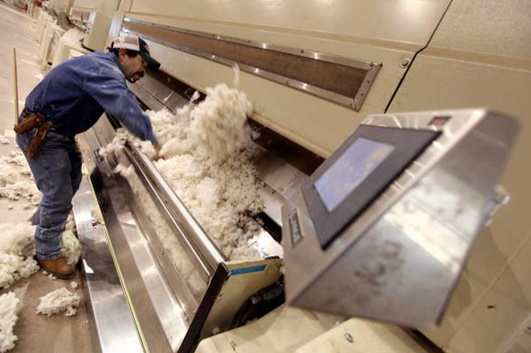 The cotton is then air conveyed to gin stands where revolving circular saws pull the lint from the saw teeth by air blasts or by rotating brushes. The cotton is compressed into 500 pounds weigh contained bales. Then the bales of cotton are shipped to textile mill for further processes. The moisture of seed mix up with fiber in processing which cause cake cotton fault.